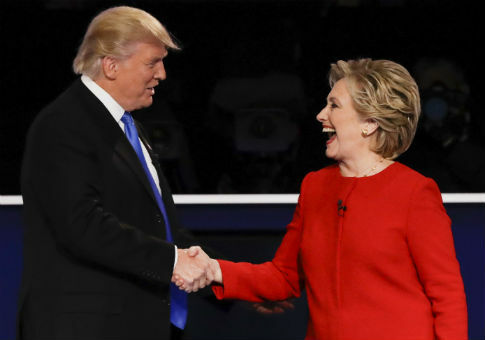 The theatrical production "Her Opponent" recreated the presidential debates by switching the genders of Hillary Clinton and President Donald Trump, and seems to have debunked the claims that sexism played a dominating role in the 2016 election and debates. Professors from New York University, Rhode Island School of Design, and the French business school Insead organized the production which took place on Jan. 28, NYU News reports. The "ethnodrama" had an actor portray Hillary Clinton while an actress played Donald Trump. Both actors learned not just what the presidential candidates said but how they said it, imitating the candidates' behavior and body language in the performances. "Her Opponent" had two showings, with the audience filling out surveys before and after on both the real debates and the mock debates they just saw. Maria Guadalupe, a professor from Insead who came up with the idea for the production, thought that Trump's behavior displayed by a woman would not be tolerated. Joe Salvatore, another professor who specializes in ethnodramas, agreed. "We both thought that the inversion would confirm our liberal assumption—that no one would have accepted Trump’s behavior from a woman, and that the male Clinton would seem like the much stronger candidate," Salvatore said. "But we kept checking in with each other and realized that this disruption—a major change in perception—was happening. I had an unsettled feeling the whole way through," he said. The mostly liberal audience was left stunned when many of them preferred the female Trump over the male Clinton. Many had believed beforehand that if a woman had acted the way Trump did, that it would negatively affect her. "We heard a lot of ‘now I understand how this happened'—meaning how Trump won the election," Salvatore said. "People got upset. There was a guy two rows in front of me who was literally holding his head in his hands, and the person with him was rubbing his back. The simplicity of Trump’s message became easier for people to hear when it was coming from a woman—that was a theme." Salvatore said that for him, Trump's behavior displayed by a woman was more appealing, and Clinton's behavior coming from a man was less appealing. "I was surprised by how critical I was seeing [Clinton] on a man’s body, and also by the fact that I didn’t find Trump’s behavior on a woman to be off-putting," he said. "I remember turning to Maria at one point in the rehearsals and saying, ‘I kind of want to have a beer with her!'" Salvatore added that he developed empathy for those who voted for Trump after the production. "The majority of my extended family voted for Trump. In some ways, I developed empathy for people who voted for him by doing this project, which is not what I was expecting. I expected it to make me more angry at them, but it gave me an understanding of what they might have heard or experienced when he spoke," he said. This entry was posted in Politics and tagged Debate, Donald Trump, Hillary Clinton. Bookmark the permalink.